Numerology is the study of numbers, or the science of numbers, and numerologists spend a lot of time pondering the numbers in our lives. They believe that numbers contain an energy and a vibration that influence us in a myriad of ways. In this model, all the numbers in our lives, from the numbers that make up our addresses, our telephone numbers, our hotel rooms, to our dates of birth -- all impact and reflect aspects of our personal destiny. In particular, the numbers associated with an individual's date of birth can shed insights on the individual's life path. When we look at the spiritual and psychological aspects of our numbers, it is an example of Esoteric Numerology, the art and science of understanding the spiritual significance and the orderly chain of progression required for all creation and manifestation. In Esoteric Numerology,numbers represent universal principles, or Divine Laws, through which all things evolve and grow in a cyclical fashion. These cycles are captured in the digits 1 through 9 which symbolize the stages through which an idea must pass before it becomes a reality. All that is created and manifested, therefore, can be understood as the result of these nine stages. Every number vibrates and every number has its inner meaning. The examination of our numbers, especially our birth number, springs from the notion that on a soul level, we each chose this particular time to be born because the numbers associated with that date of birth contributed to who we would become, as well as defined the people and events to which we are drawn. Our soul prescribed the lessons and experiences needed for its growth, and chose the appropriate number vibrations to correlate with those experiences. These numbers help shape our life path, our perspectives on life, our energy levels and our attitudes. They may even contribute to our self-concept, our self-esteem, career path, the makeup of our family, our relationships and our overall potential for success, and happiness, or disharmony and struggle. The soul, as the director of our lives, is a wise teacher. In fact, Faith Javane, author of Numerology and the Divine Triangle says: "The letter and number code, when rightly understood and applied, brings us into a direct and close relationship with the underlying intelligence of the universe." Thus for the date of birth of August 6, 1978, the birth number is 3 and the corresponding Tarot Card is The Empress. In the Tarot "system," The Empress, Key #3 of the Tarot’s Major Arcana, represents nurturing and creative energies. When operating as a birth card, it relates to a life of creativity, nurturing, and working in harmony with the laws of nature. It may suggest a sense of interconnection with others, with nature and with all living things. The Empress emphasizes feminine spirituality, with the Goddess mind of love and compassion. She contains the creative spark and expresses that creativity in many different ways, such as art, gardening, motherhood, writing, and the like. Your birth number and card sets up the vibration for your entire life, from the moment of your birth, to the moment of your death. You can use this card as a means to stay grounded and focused. It can serve as a guide or role model to assist you in decisions. You can use it in meditation. Think of the card as your Higher Self, your personal way shower and guide, your own personal power figure. It may help you keep motivated and diligent. It may even allow you to get insight and perspective on your life patterns and issues. You also may consider the relationship of your own personal birth card to the global year card (which is The Chariot), to see if there are any similarities, correspondences, or conflicts. As you might expect, your individual path contributes to the overall evolution of the global mind. Note that your birth card does not dictate the events and outcomes in your life. It allows you to take full advantage of the potentials available in your life time, and to prepare you for any difficulties that may occur. You still maintain the responsibility for making the most of your life's potentials and coping with any adversity. Your birth card will help you navigate through your life, but your fate is still in your own hands. I have added a brief description of the 22 Major Arcana cards at the end of this article, so that once you have calculated your birth number and card, you can begin to think about what and how its meaning has operated in your life thus far. In the Tarot system, Key number 7 of the Major Arcana is The Chariot. If you accept this notion of One Mind or One Consciousness, then The Chariot archetype can represent the energy that unites us all for the year. Along with our birth number and corresponding card, it offers guidance for 2014. The Chariot card depicts a person holding the reins of a chariot, led by two animal figures. This card symbolically explores the way in which you “drive” your chariot, which serves as a representation of yourself and how you conduct your life. Consequently, The Chariot is about the way you animate yourself, how you feel about yourself, how you “harness” your life – your presentation, your personality, your speech, your ideology. The imagery of the reins tells us that these traits are in your own hands. Ultimately, this card is about taking responsibility for your life; it is the quintessential “proactive” card. The Morgan Greer Tarot deck (see image) clearly shows that the driver has the reins in his hands. The driver addresses obstacles and adversity with intention and perseverance, overcoming obstacles by driving around, over, or down a different path. The point is that the driver makes the choice – not the obstacle. The implication of the imagery: Whatever adversity might come along in your life, use it as a challenge or stepping stone to finding other ways to accomplish what you seek. Each rejection, each misstep, each disappointment has a lesson in it on how to do it better next time (provided you let it). In the process, you ensure that you will succeed. If you have challenges around personal responsibility, if your life is filled with drama and struggle, imagine yourself as The Chariot (with the reins in your hands), true to your path, unwilling to let mistakes and failures keep you from your success. As Winston Churchill said, "Never, never, never, never give up." The Chariot asks us to ponder these questions: Is your approach to life proactive or reactive? Who is the causative agent in your life – you or your life experiences? In today’s chaotic world, it is hard not to feel powerless – there is terrorism, natural catastrophes, the threat of nuclear war, biological war, road rage, random shootings, and so on. How do we cope with all this? And what about our personal relationships and interactions? How do we cope with rejection, disapproval and disappointment? Stephen R. Covey, in his book, The 7 Habits of Highly Effective People, states that “Reactive people are affected by their social environment, by the ‘social weather.’ When people treat them well, they feel well, when people don’t, they become defensive or protective. Reactive people build their emotional lives around the behavior of others, empowering the weaknesses of other people to control them.” Covey stresses the importance of making a “paradigm shift” in order to become more proactive. He explains this proactive paradigm shift to mean that “as human beings, we are responsible for our own lives. Our behavior is a function of our decisions, not our conditions.” The Chariot imagery is a wonderful depiction of Covey’s proactive vs. reactive dichotomy. The card symbolically puts YOU in the driver's seat. The analogy of The Chariot card can provide a clear model of personal power, an image that can be projected into the unconscious mind. The Chariot's message underscores a powerful lesson about life: You can be in charge of your life if you choose to. You and only you have the power to move forward, to overcome obstacles and to achieve what you seek. Your success and worth does not depend on outside circumstances or forces. Perhaps we cannot control what happens to us, but we can control how we respond to life events. If the Charioteer could speak, he or she might say, “If it’s going to be, it’s up to me.” This is not the speech of a victim. Rather, the Charioteer presents the opposite -- the promise of success through self-determination. By meditating and/or visualizing the card and allowing the symbol to be absorbed into your unconscious mind, you may achieve the confidence and will to take control over the circumstances of your life. Are you motivated by an inner force, a force based on your belief in your intrinsic worth? Or, is an external need for conformity or approval your “driver?” Think of yourself as The Chariot. You are in the driver's seat. Learn to be resourceful. When this card appears in a Tarot reading in response to a project, it suggests that the self-confidence is rightly placed and encourages full speed ahead. Your project is headed for success if you choose to continue on your current resolute path. The general meanings of the card, therefore, include perseverance, success, triumph over adversity and great accomplishment, with emphasis on personal responsibility; staying true to one's chosen path. 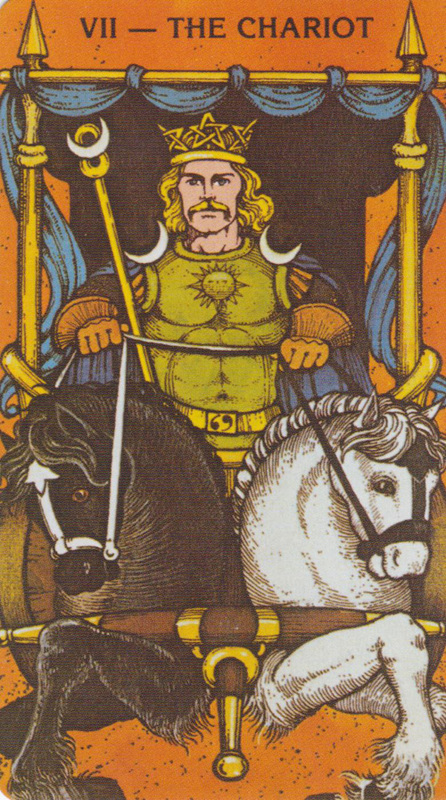 The Chariot card conveys success and victory, but only through diligence and the ability to overcome adversity through personal responsibility. The Chariot represents someone who achieves success because of fierce determination, an individual who stays on course and who is true to his or her purpose, a person with an unswerving commitment to whatever path or goal has been set. Such an individual never blames others for his fate, nor does he feel shame or guilt for his own failings or shortcomings. Maybe we can’t do much about terrorism, road rage and threats of nuclear war. But then again, maybe we can. Mother Teresa said, “Do not wait for leaders; do it alone, person to person.” Margaret Meade once said, “Never doubt that a small group of thoughtful, committed citizens can change the world. Indeed it is the only thing that ever has.” Maybe one small step is to assume responsibility for our own lives, to stop blaming others. If we want to make a paradigm shift to being more proactive, we can begin by examining the times in our lives in which we think that the problem is “out there.” From a global and political perspective, taking responsibility means that we stop the "blame game." We give up blame, not only in our personal lives, but also on a national level, and an international level. The Covey paradigm and The Chariot’s message are one and the same: shifting one’s point of reference from the “outside-in” to “inside-out.” The dynamics of life, the influences of life work both ways – the events of the world impact our lives, but we also impact the events of the world. Our own individual acts and accomplishments – such as small acts of kindness, voting, forgiving the driver who cut us off, recycling our newspapers, giving up blaming others for our problems, volunteering at a soup kitchen, teaching an adult to read, buying free trade coffee (really the list is endless) can start a tiny change that can eventually affect the entire world. By becoming more proactive, both personally and globally, by remembering The Chariot that resides within, we can impact the world in a positive way. Welcome to 2014 and a year of proactive living! Below are some very basic meanings for the 22 Major Arcana cards that can help you understand your personal birth card once you have completed your calculations. Please note that you don’t need to understand the meanings of these cards, or have had any previous experience working with the cards. Look at the card, jot down any ideas you have about its import, or do some more extensive journaling about it. See what comes up and how it unfolds. Geraldine Amaral is the author of Tarot Celebrations: Honoring the Inner Voice, creator of “Tarot 1-2-3,” an instructional video and has been writing for Pathways for 20 years. She fell in love with the Tarot about 30 years ago when she had her first reading and has been using, studying and writing about the Tarot ever since. She utilizes Jungian/archetypal psychology and Divine Metaphysics in her work and is a respected/gifted intuitive counselor and nationally-known teacher. She focuses her work on how to apply the Tarot's esoteric principles in pragmatic ways as well as for insights and personal transformation. Her classes provide a unique blend of spirituality, psychology, philosophy, humor, literature and personal empowerment methods. She can be reached at 703-671-7421 or geraldine@thespiritualtarot.com. You can visit her website www.thespiritualtarot.com.